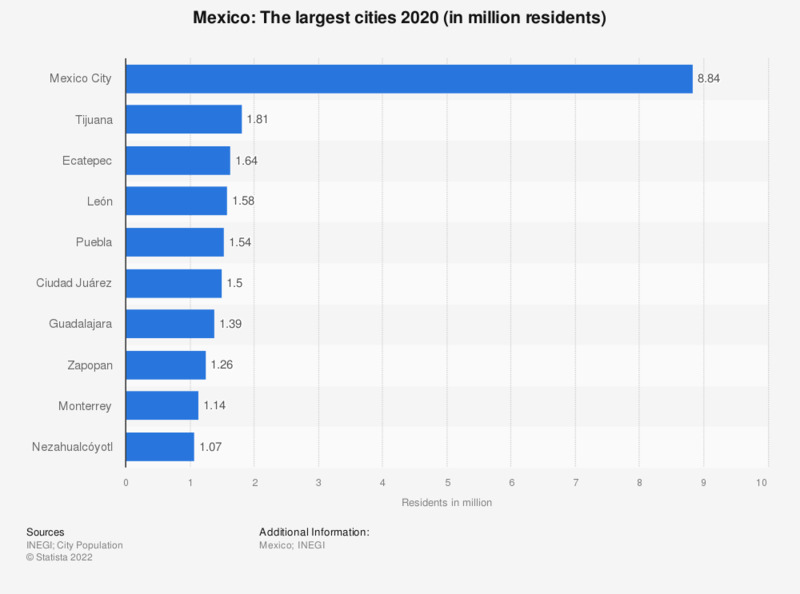 The statistic depicts the ten largest cities in Mexico in 2014. In 2014, Mexico City had around 8.56 million residents which made it the largest city in Mexico. Mexico is a federal republic located in North America, sharing borders with the United States to the north, and to the southeast with Guatemala and Belize. With a total area of over 1.9 million square kilometers, it is the fourteenth largest nation in the world and the fifth largest in the Americas. In 2014, Mexico’s total population amounted to approximately 120 million people. A little under two thirds of Mexico’s total population is of Mestizo ethnicity. The total population has steadily grown over the past decade, despite being the source to the largest migration flow between countries in the world; in 2010, around 11.6 million immigrants from Mexico lived in the United States. The migration flow between the United States and Mexico has however, decreased over the past ten years: Between 1995 and 2000, over 2.9 million migrants emigrated from Mexico to the United States. This was more than the double of migrants who emigrated from Mexico to the United States between 2005 and 2010. Each year, Mexico's population grows by about 1.24 percent compared to the previous year. Mexico City, the country’s capital and largest city, is home to approximately 8.6 million people.